Unai Emery's side have been drawn in Group E of this season's competition with the Portuguese club, Qarabag of Azerbaijan and Ukrainian side Vorskla. 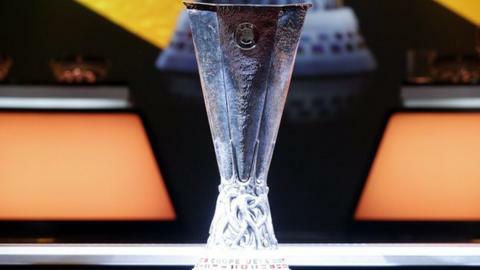 The final of this season's Europa League takes place in Baku, the capital of Azerbaijan, on 29 May. Spanish clubs have won the competition for five of the last seven seasons and Sevilla - who triumphed under Emery in 2014, 2015 and 2016 - have been drawn to face Russian side Krasnodar, Standard Liege of Belgium and Turkey's Akhisar. Dudelange, the first club from Luxembourg to reach the group stage of the competition, were handed a trip to the San Siro to play AC Milan. Arsenal will face about 10,000 miles of flying for their three away fixtures, including a lengthy flight of more than 2,400 miles to Baku, where Qarabag play. The Gunners will take on a Sporting side decimated by players cancelling their contracts this summer following an attack by fans at the training ground last term. But they have started this season with two league wins and a draw to sit third in the Portuguese top tier, with former Manchester United winger Nani finding the net three times. Vorskla, winners of the Ukrainian title in 2017-18, have only reached this stage of the Europa League once before but finished bottom of their group in the 2011-12 campaign. Qarabag have been managed by Gurban Gurbanov - who is now also in charge of the Azerbaijan national team - for a decade. They competed in the Champions League last season but have lost their four European matches against English opposition by an aggregate score of 14-1. Did you know? Arsenal have lost four of their last five European games in Ukraine, drawing the other. Hungary for Blues but which ground? Chelsea have less travelling than their London rivals with about 6,800 miles to cover for Thursday fixtures on the road. Vidi, who changed their name from Videoton this summer, have not featured in the group stage since 2012-13, when they produced home wins over Sporting Lisbon and Basel at their home stadium, which is under reconstruction and has faced recent delays. They played at the home of Ferencvaros for their recent Champions League play-off with AEK Athens, which they lost to drop into the Europa League. PAOK Salonika, who finished second in the Greek top tier last season, also dropped out of the Champions League having lost their play-off against Benfica. BATE Borisov lost 4-2 and 6-0 to Arsenal in last season's Europa League to eventually finish bottom of their group. Did you know? Teams from Hungary have failed to win any of their last 18 European visits to England, drawing two and losing 16. They have scored just four goals on English soil and conceded 40.